I’ve been designing and building custom furniture for over 25 years; first, it was a hobby, but now it is a portion of my total portfolio, which also includes cabinetry and remodel carpentry. So when thinking about this article, I naturally thought of the beds I’ve made and classic woodworking. It would be easy for me to come up with a DIY headboard with a full cabinet shop at my disposal; for you, however, it may be more of a challenge. To that end, this article will cover some more diverse options that are aligned with the average DIYer. The job of converting an old door into a DIY headboard can be as simple as screwing it to the wall, or it may involve some minor resizing and trimming. Converting a mirrored panel can also be a fairly simple task. If attaching a large, heavy piece, make sure you use the proper anchors to keep it firmly attached to the wall. Working with an old fireplace mantel may be a bit more challenging. Here, the mere size and weight may require some more advanced carpentry skills to get it mounted, leveled and secured. If you're lucky to find the perfect sized unit, it may rest directly on the floor and only need some minor support. Another idea is to make a headboard by painting a unique pattern or detail on the wall behind the bed. This is one of the simpler ways to add a little style to the bedroom. Fabric or upholstered headboards are also popular. Here, a simple wooden frame can be built and some fabric or an old quilt can be stretched over the frame. Once built, hang it behind the bed. A French cleat is a great way to attach an object like this. If the bed is located away from the wall, a freestanding screen or divider is great way to separate the room and provide a headboard. These can often be found at import stores. Asian-influenced Shoji screens or more traditional Mission styles can complement the décor in your bedroom. 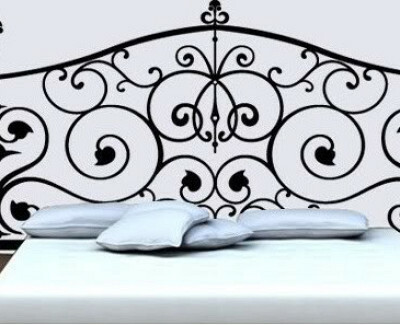 I remember seeing a metal garden gate being used as a headboard on a home improvement TV program a few years ago. The designer incorporated some vines and floral elements into the project to enhance the rustic rusty metal of the old gate and make a headboard. As you can see from the previous examples, building your own DIY headboard does not require 25 years of furniture design and building experience. Some great finds can be had at your local architectural salvage yard or a number of alternative sources. Your design and project can be as rustic as an iron garden gate or involve a classic old mantel. The choices are purely up to you. Are you looking for other DIY projects? Build your own storage cubbies, install a ceiling fan, create a pillow out of an old t-shirt, make a toy chest or assemble a bookshelf out of a ladder. Not interested in doing it yourself? 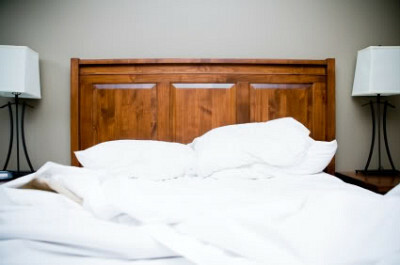 Find a remodeler to custom-make a headboard for you. Fill out the form below. Author Kevin Stevens moved to Colorado from Michigan in 1991. He has been a woodworker for over 30 years, and has also worked as a biotechnology engineer. Kevin now runs a remodeling business where he practices green technology and sustainability. He is currently building an off-grid cabin in New Mexico.